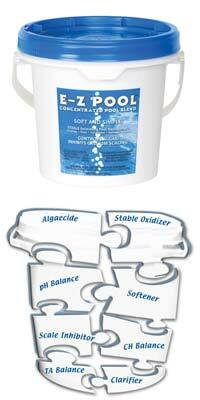 E-Z Pool combines simplicity and incredible water quality in a once-a-week application. Stop performing reactive maintenance and embrace proactive maintenance with the E-Z Pool system. This specially blended, multi-tasking formula manages swimming pool water while eliminating the confusion of adding multiple chemicals every other day. E-Z Pool contains a stable oxidizer, algae shield, clarifier, scale inhibitor, water conditioner and pH, alkalinity and calcium hardness balancers to keep swimming pool water clean, clear and trouble free. It provides a PROACTIVE water care program that PREVENTS problems instead of treating them on a REACTIVE basis after they occur. E-Z Pool is compatible with chlorine, salt, bromine, UV and ozone as well as traditional balancers and maintenance chemicals. E-Z Pool is available in 3 convenient sizes: E-Z Pool – 5 lb, E-Z Pool – 10 lb, and E-Z Pool – 20 lb. The easy-to-use start-up product Revive! is available in a 32 oz. bottle that attaches directly to your garden hose. Due to minimum advertised pricing standards we are not allowed to list what we sell these products for until you add them to your shopping cart. We apologize for any inconvenience. Check out this video explaining the virtues of this innovative system. This entry was posted in E-Z Pool, New Products, Pool Water Care, Uncategorized and tagged 00EZP05, 00EZP10, 00EZP20, 00EZREV32 on May 29, 2014 by admin.